2 Loanable Funds Demand for funds: those who are deficit spending units (specially those in business who want to invest) borrow. 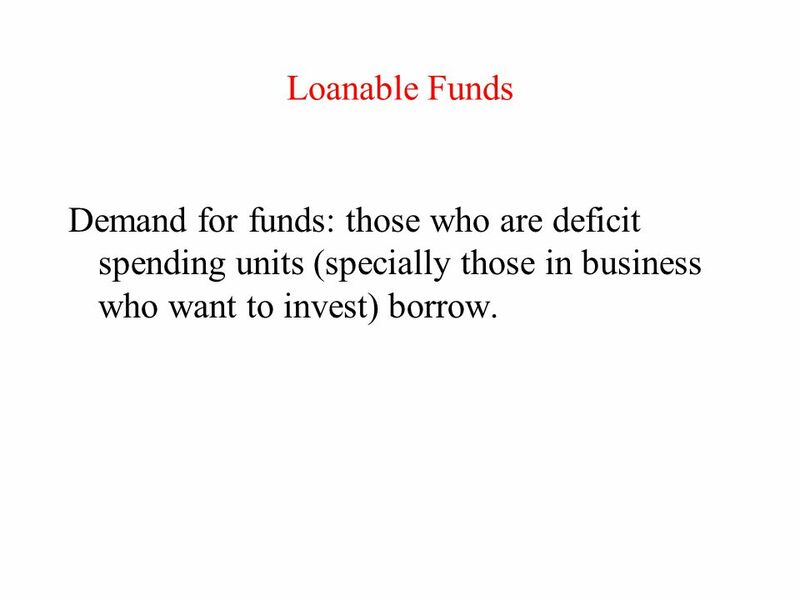 3 Loanable Funds Demand for funds: those who are deficit spending units (specially those in business who want to invest) borrow. 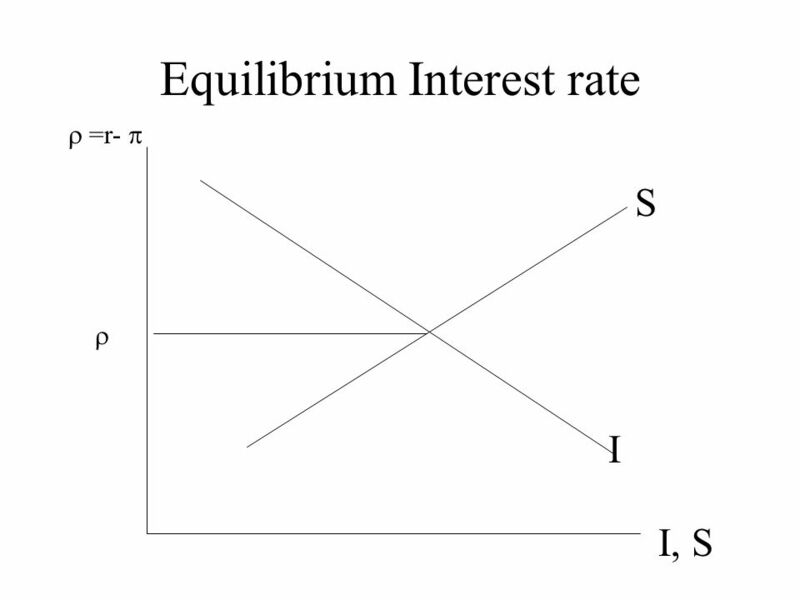 In the classical model, the desire to spend more depends negatively on the real rate of interest. 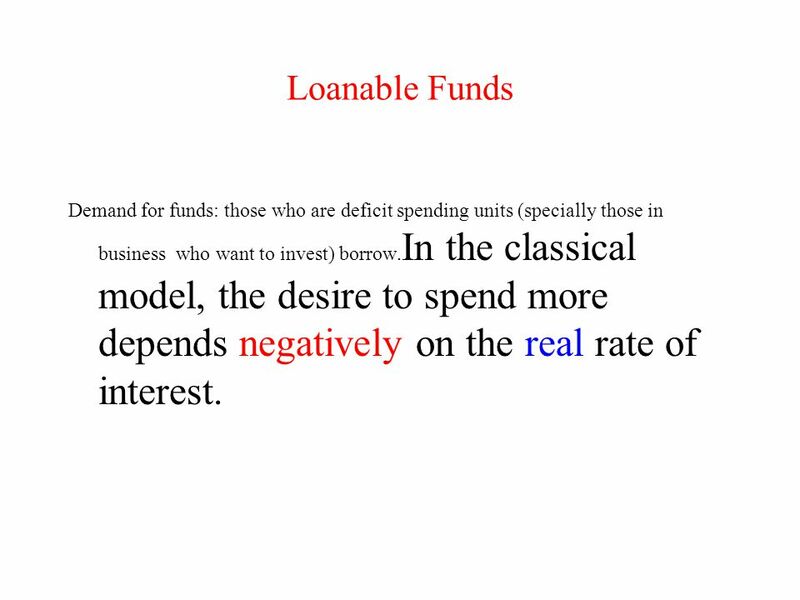 4 Loanable Funds Demand for funds: those who are deficit spending units (specially those in business who want to invest) borrow.In the classical model, the desire to spend more depends negatively on the real rate of interest. As real rate of interest rises, cost of borrowing will be higher and therefore, less is borrowed. 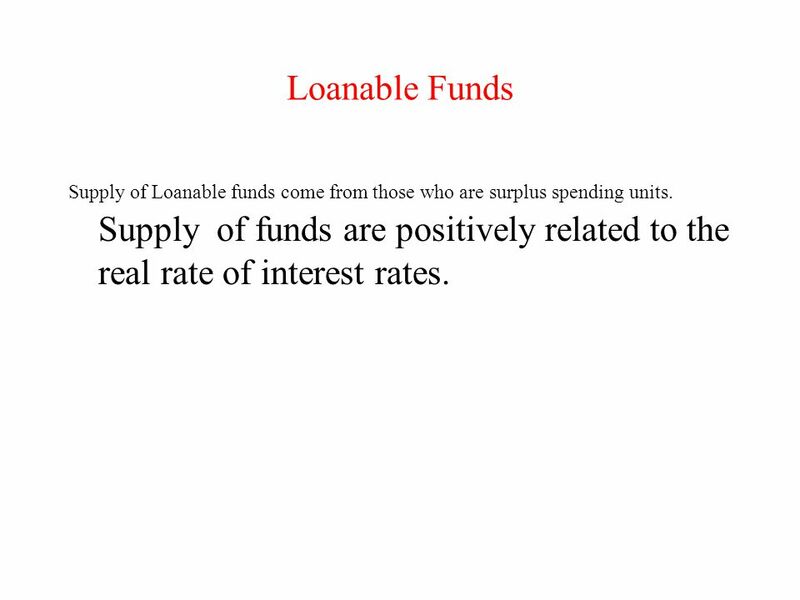 5 Loanable Funds Supply of Loanable funds come from those who are surplus spending units. 6 Loanable Funds Supply of Loanable funds come from those who are surplus spending units. Supply of funds are positively related to the real rate of interest rates. 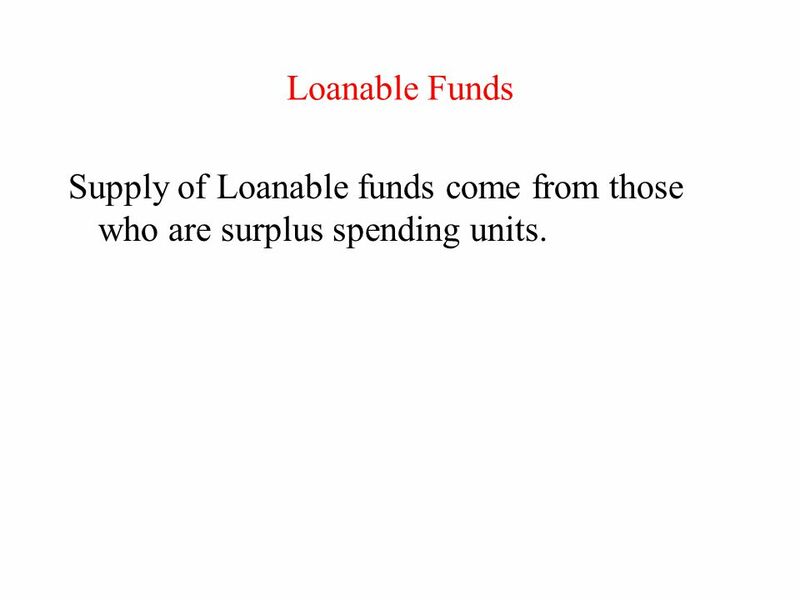 7 Loanable Funds Supply of Loanable funds come from those who are surplus spending units. Supply of funds are positively related to the real rate of interest rates. As real rates rise, more current consumption are forgone for the higher future consumption. 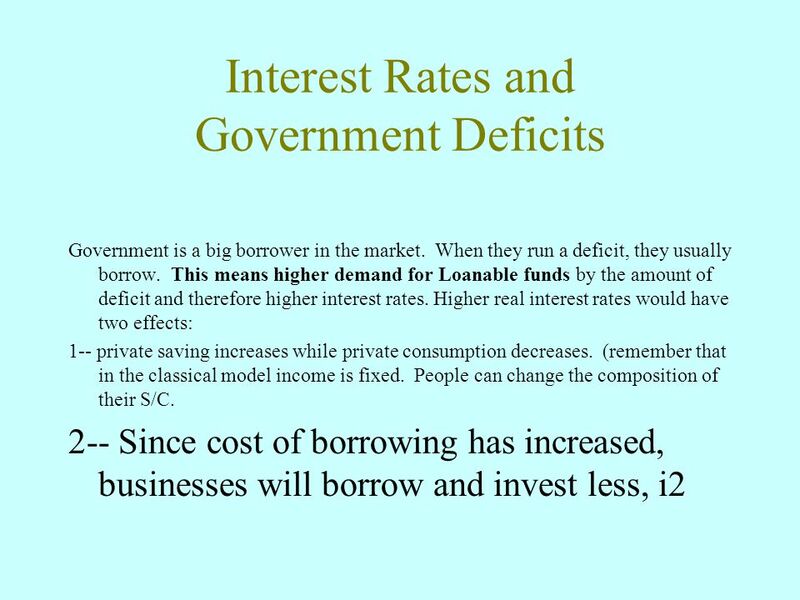 9 Interest Rates and Government Deficits Government is a big borrower in the market. When they run a deficit, they usually borrow. This means higher demand for Loanable funds and higher interest rates. 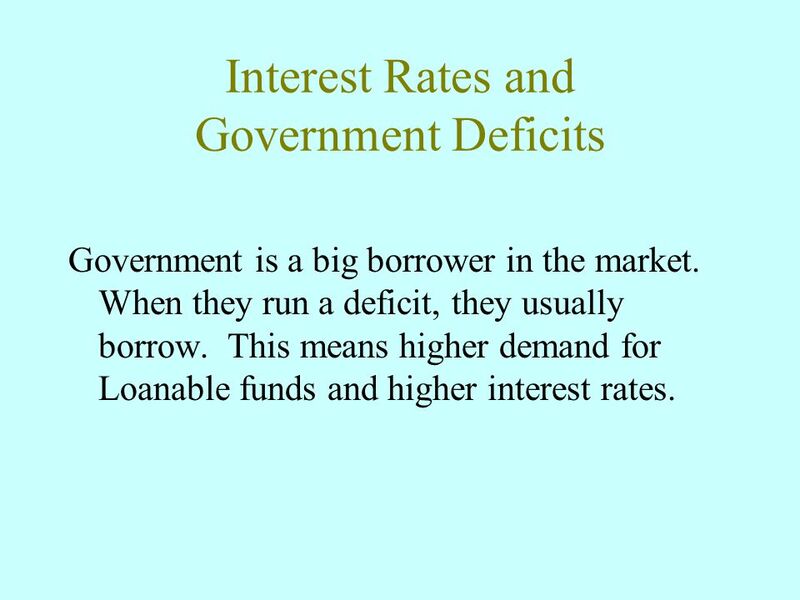 10 Interest Rates and Government Deficits Government is a big borrower in the market. When they run a deficit, they usually borrow. This means higher demand for Loanable funds and higher interest rates. 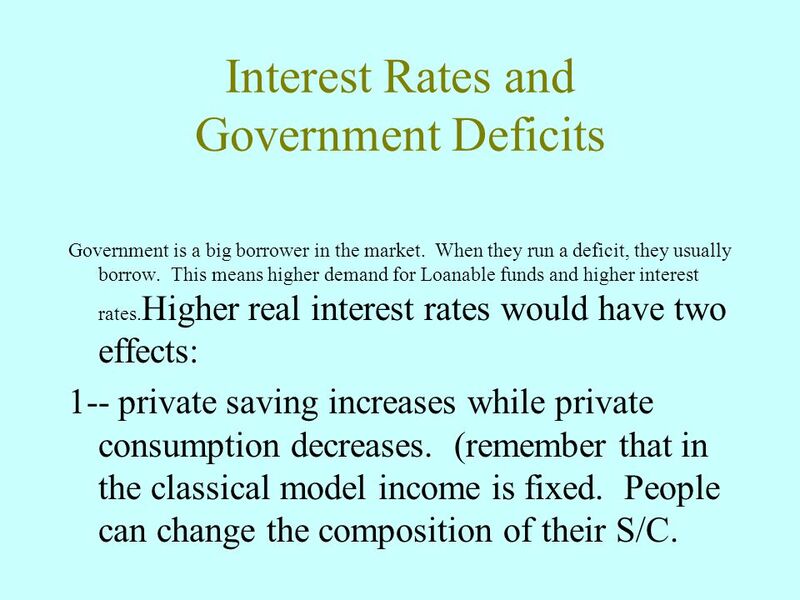 Higher real interest rates would have two effects: 1-- private saving increases while private consumption decreases. (remember that in the classical model income is fixed. People can change the composition of their S/C. 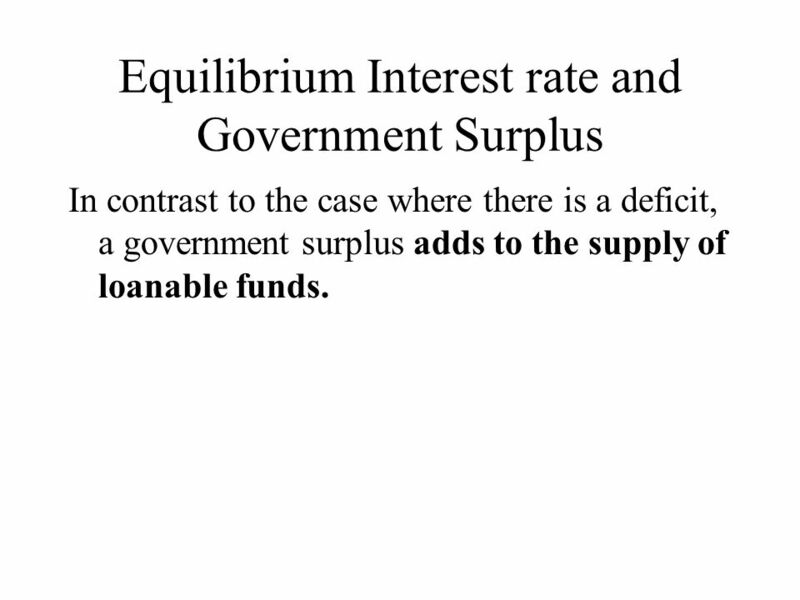 13 Equilibrium Interest rate and Government Surplus In contrast to the case where there is a deficit, a government surplus adds to the supply of loanable funds. 15 Monetary and Interest Rates In the classical model, Saving and Investment are real variables and not affected by the monetary policy. 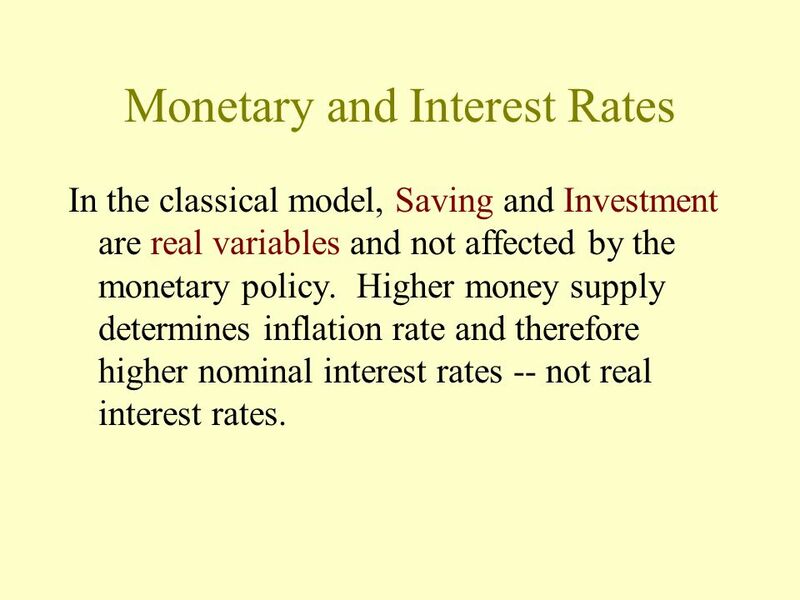 Higher money supply determines inflation rate and therefore higher nominal interest rates -- not real interest rates. 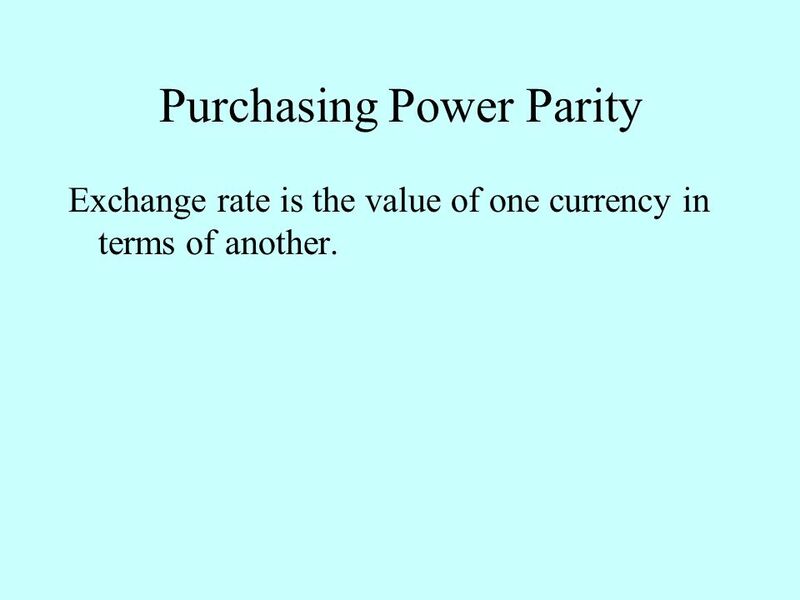 16 Purchasing Power Parity Exchange rate is the value of one currency in terms of another. 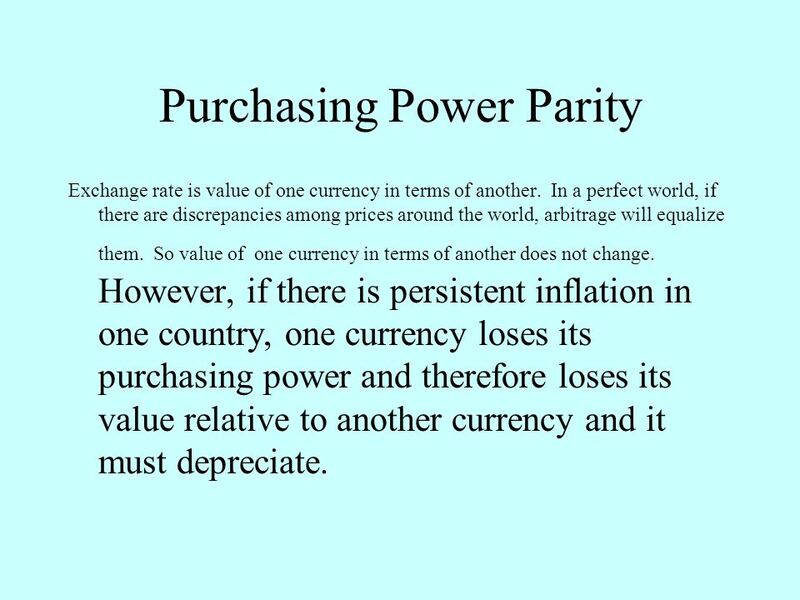 17 Purchasing Power Parity Exchange rate is value of one currency in terms of another. In a perfect world, if there are discrepancies among prices around the world, arbitrage will equalize them. So value of one currency in terms of another does not change. 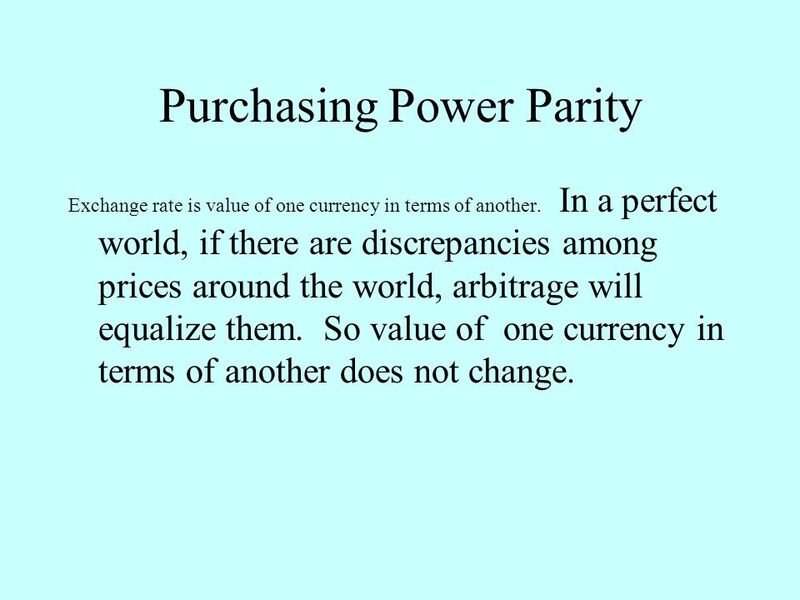 18 Purchasing Power Parity Exchange rate is value of one currency in terms of another. In a perfect world, if there are discrepancies among prices around the world, arbitrage will equalize them. So value of one currency in terms of another does not change. 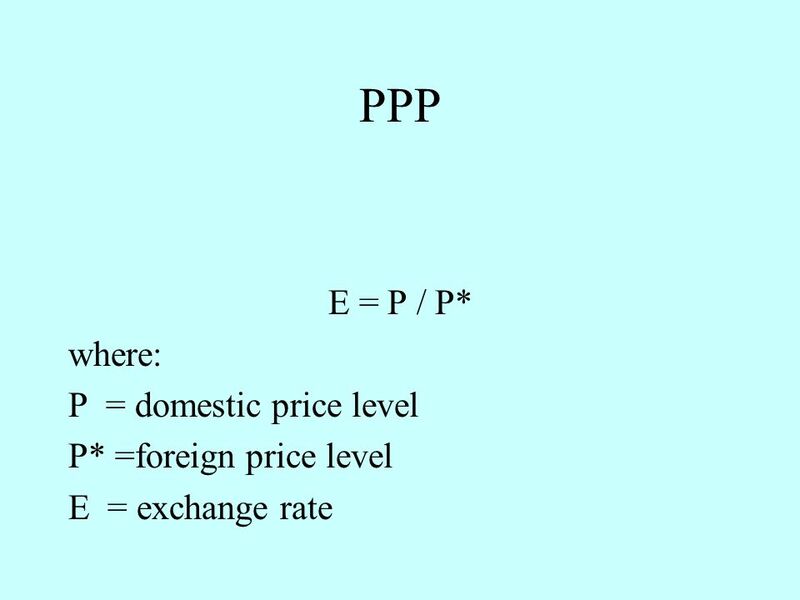 However, if there is persistent inflation in one country, one currency loses its purchasing power and therefore loses its value relative to another currency and it must depreciate. 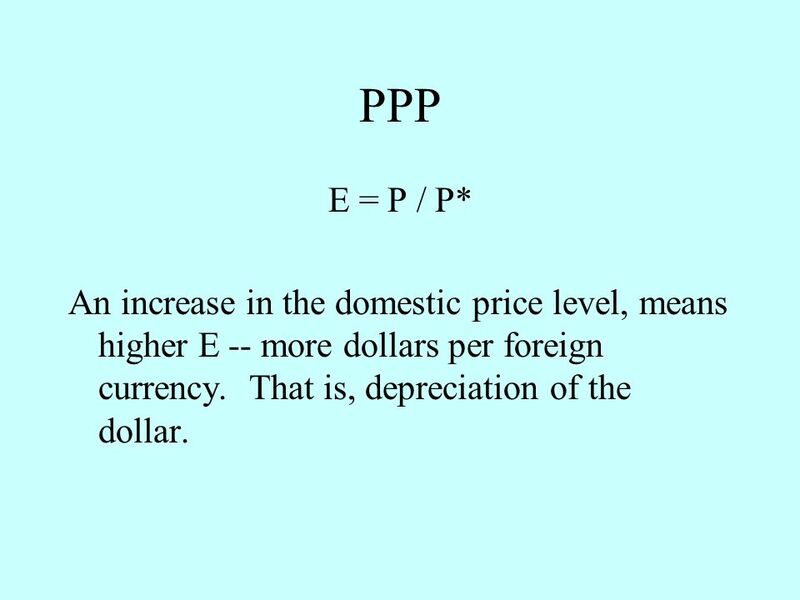 20 PPP E = P / P* An increase in the domestic price level, means higher E -- more dollars per foreign currency. That is, depreciation of the dollar. 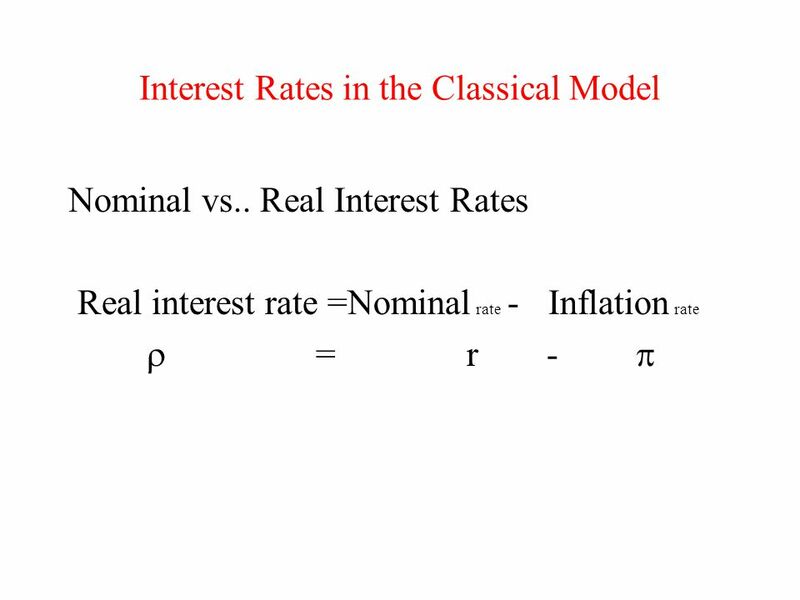 Download ppt "Interest Rates in the Classical Model Nominal vs.. Real Interest Rates Real interest rate =Nominal rate - Inflation rate  = r- "
The Loanable Funds Market. 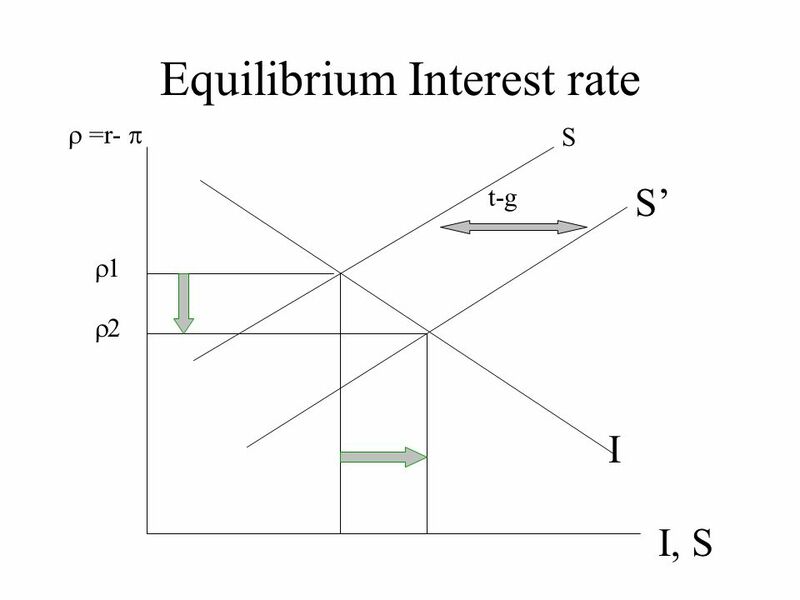 Equilibrium Interest Rate Savers and buyers are matched in markets governed by supply and demand There are many markets, but. 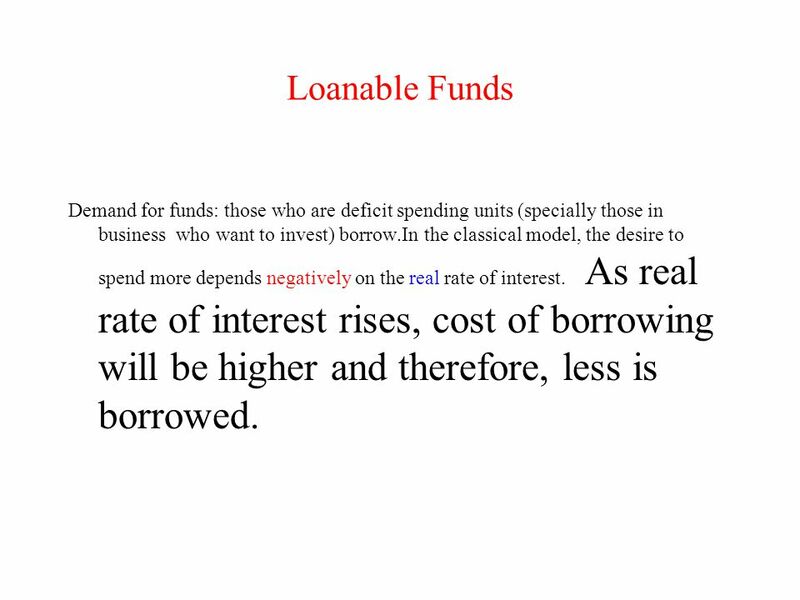 The Money Market and the Loanable Funds Market 1. A Macroeconomic Theory of the Open-Economy. Outline:  Develop a model to study forces that determine the open economy variables (NX, NFI, RER)  How. FIN 40500: International Finance Nominal Rigidities and Exchange Rate Volatility. 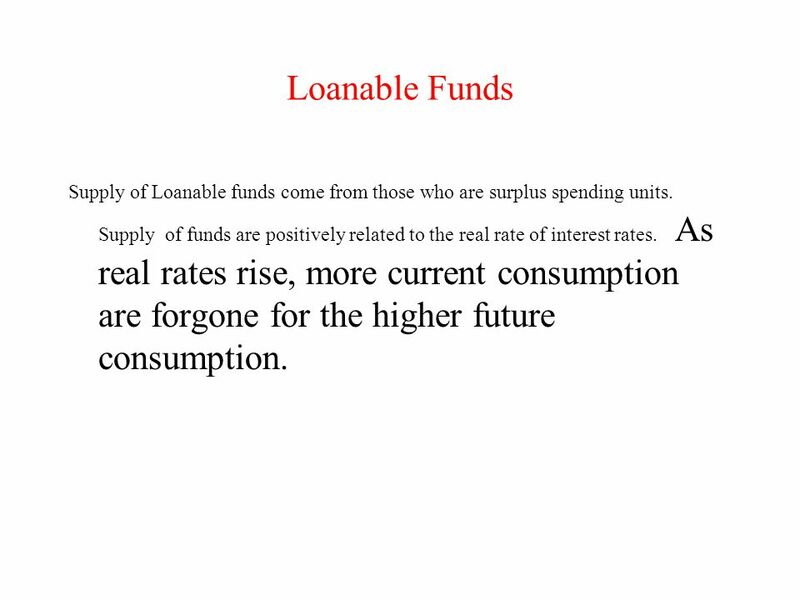 Unit 4: Money and Monetary Policy THE FED Real vs. Nominal Rates and the Loanable Funds Market 2. Unit 4: Money and Monetary Policy 1. THE FED Monetary Policy 2. 24 FINANCE, SAVING, AND INVESTMENT © 2012 Pearson Addison-Wesley. Copyright © 2009 Pearson Addison-Wesley. All rights reserved Monetary Approach to Exchange Rates (cont.) A change in the money supply results in. DETERMINATION OF INTEREST RATES OBJECTIVES 1. 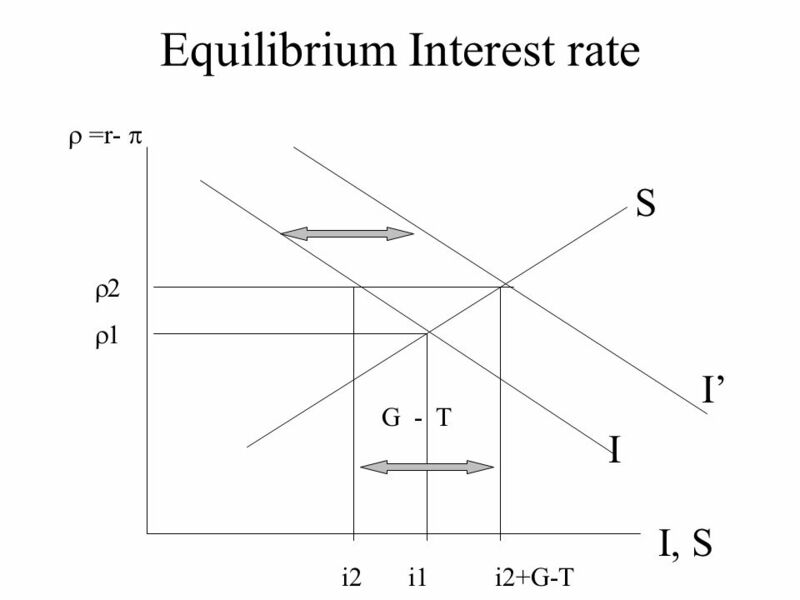 To explain the Loanable Funds Theory of interest rate determination 2. To identify the major factors affecting. C h a p t e r seventeen © 2006 Prentice Hall Business Publishing Economics R. Glenn Hubbard, Anthony Patrick O’Brien—1 st ed. Prepared by: Fernando & Yvonn. Managing an Open Economy Small Open Economy. Learning Objectives Introduce the concept of the small open economy. Develop the IS and LM models for a small.